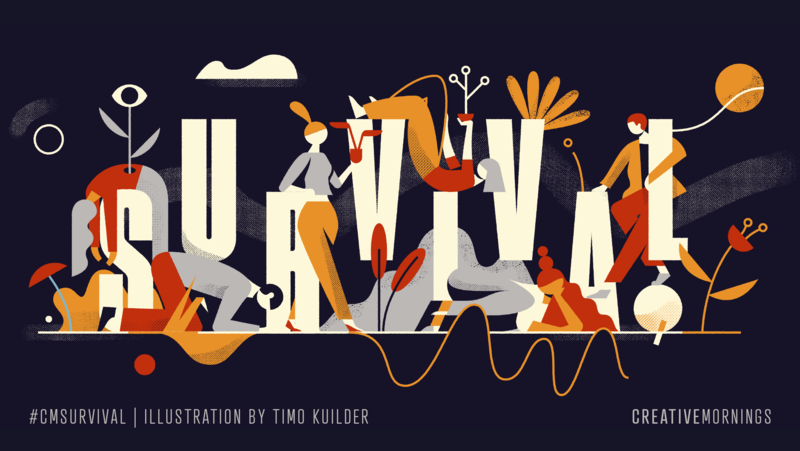 This month, our creativity will be empowered by the humbling stories of survival—from job loss, heartbreak, to life-altering moments. We must not forget that the necessity of survival imbues us. The fact that we're fragile and complex doesn't make us weak; in fact, it makes us stronger. Larry Legend Larry Legend performs "When the Zombies Come"
Jess Huddart A flight from Paris and being fired. Andrea Kramp Wer war noch gleich Fred Stein? AC Coppens What’s your human USP? Teams need to be able to engage in creative abrasion. Creative abrasion means we can have conflict around ideas and how we work together and what we’re going to do together but we’re not having conflict because of personality or identity. If you want to be creative, you have to be deliberate. Breathing is automatic but creativity isn’t. Take any painful experience, any type of adversity that you may be faced with, and use it to bring more light into the world. Being a survivor is not just limited to living through a tragedy. Being a survivor is taking that tragedy and making it purposeful. This is what makes me a survivor: taking a negative experience and flipping it upside down, making it positive. Me being able to forgive has empowered me. It has showed me that I can still live a positive lifestyle regardless of my physical circumstances. I’m able to embrace each and every moment. Abre todas las puertas. Lo último que quieres es arrepentirte de algo que no hiciste por miedo. Diario tomamos decisiones pequeñas y grandes que forman nuestro futuro. We have got power! By controlling our environment and lifestyle, we have got the power to control which genes will be expressed, and which genes will be silent! We live in a world where "medicine" has become toxic, "food" has become nutritionally depleted and heavily contaminated, and "toxins" are bioaccumulating in the body and passing from generation to generation. About 200 years ago, "survival" was a completely different concept! This is the issue we have to understand, take it on board and actually accept it - yes this is the challenge of our society, but there is so much we can do about it! For example, type 2 Diabetes didn't exist in children at all a few years ago, and now its growing with a 3.5 annual rate. This is maybe the first generation of children to have a shorter life expectancy than their parents. Sometimes for each of us, sometimes it just takes a spark. That little, bitty spark of kindness that will be able to make a difference in someone's life and affect how they change their life. Lo importante es mantenerse humano. El target entonces es el corazón. Cupido jamás apunto a una rodilla o a una oreja. When you see somebody that looks different from you and they raise your eyebrow, put your eyebrow down. Get to know them for them. Survival is speaking my truth in a world that doesn't take the time to understand my truth. Sharing someone's story is a privilege, not a right. Nobody owes you a story. When you have to figure out in a place, where you have no solutions. That is a place, where real creativity happens. Only way to really enjoy it - is if you embrace the struggle. It's okay to get to a point in life and realize what you're doing isn't for you anymore. I threw myself into a totally new role at the age of 40 was, to say the least, very humbling. All of a sudden I had to find myself asking for help, saying I didn't know how to do things, and crying a lot. When you go through adversity, you shouldn't pity the life you have; you should respect it and don't question it. Just because I'm different from me doesn't mean that I owe you an explanation for my difference. I used art as an escape. Temporary autonomous space is a space where you suspend the rules and the consensus agreements about culture and behavior and you make new ones to try out and I think about studios as temporary autonomous spaces. What would be the scariest thing to do next.... use that to figure out what to do next... If I am really terrified of it there's heat there. (Mission) aligns me with other people in my field because if we all succeed then we have more impact. Once you know your practice and you deepen it, it is easier for people to pay you. Underneath everything we do in our working world like there's this one crazy truth which is we're just slowly inexorably getting really good at something. Projects are years but work is decades. If I am in a compassionate relationship with you it doesn't help me to figure out how we are different it only helps me to figure out how to reconcile our differences to find our sameness so I can support you in that sameness and lift you up. Nothing is worth the wear of winning but laughter and the love of friends. We can either be self-sufficient entirely, or we can learn to be useful to others. If I'm willing to explore those other points of view– I will have a better sense of who I am and a better ability to find the path. If I am in a compassionate relationship with you, it doesn't help me to figure out how we're different. It only helps me to figure out how to reconcile our differences to find our sameness, so I can support you in that sameness, and lift you up. Do not take yourself too seriously, no one else does. Do not burn bridges, just loosen the bolts a little each day. Roadblocks only block the road — they do not block the grass, the path, the river or the way less traveled. You cannot live long enough to make all the mistakes yourself, so learn from the bad judgement of other people. If I’m willing to explore those other points of view, I’ll have a better sense of who I am and a better ability to find the path. The way that you survive is that you just solve the immediate problem. Then you solve the next problem. Then you solve the next problem. A lot of what we think of as 'survival skills' are really what people do every day. It's not necessarily our music that needs to adapt, what needs to change is how we present it. It's really important & really meaningful that we are cultivating some sort of creative community in Fort Lauderdale. I really wanna thank you guys for for showing up to other people's stuff. I really want to encourage you to show up to other people's stuff because that's how we're going to grow the creative community. June 9 Lancement Creative Mornings à Lyon ! June 9 Igor D'India | Sopravvivere è terribile (ma doveroso). June 16 Юнона Лотоцька: «Починаємо і ... кидаємо». Як довести бажане до кінця? Закономірності успішних змін.